Color Club always has something awesome for us every season and this Fall is no exception. Pure awesomeness. On The Wild Side. Blue-ish gunmetal grey frost. Okay, this is the only one I'm not crazy about. I like the shade, but it's really frosty and I'm not wild about frosty finishes. It's not a dupe of BB Couture For Men Blue Steel- it's lighter and more frosty. On the other hand, it does remind me of a Motley Crue song. Love 'Em, Leave 'Em. Light warm gold with subtle holographic effect. Another holo from Color Club! Yay!! This shade, however, is a subtle holo. It isn't as holographic as previous Color Club holo shades like Revvvolution. It's a very dense, very warm toned light brown gold shimmer. Rule Breaker. Deep teal-green shimmer. Oooooh pretty. I don't normally think of fall when I see teal, but this one says fall to me! Power of suggestion? Who knows. Either way I love it. This has a shimmer finish that almost verges on frosty, but it's not frosty- just a really fine metallic shimmer. Wild And Willing. Gold-coral-orange-green-pink multichromatic pearl shimmer. This one needed three pictures because it's so cool. It flickers! It's mainly pink and gold and on the edges you can see this really cool greenish gold duochrome. And this isn't your average shimmer, either- it's made of little round crystal pearls of shimmer. Wild At Heart. DEEP PURPLE HOLOGRAPHIC. Yes, I said purple holo! It's about time, woooohooo!! Anyway, this is a great deep purple, I'd say that it's a little more red-toned than it looks in this picture. This is also subtle as far as holos go, but not as subtle as Love 'Em, Leave 'Em. The holographic effect is also not as colorful as a regular holo, as you can see by the picture. That doesn't make it any less gorgeous, I can see myself going through a whole bottle of this. I need backups. With Abandon. Black creme base with flecks of brownish gold shimmer. This is pretty unique- I don't own any polishes that look like this. Maybe it looks like one of those Chanels? Something de Russie? I don't have them to compare, but it does strike me as being somewhat similar. Anyway, this is pretty cool- very dark with little flecks and flakes and pearls of shimmer, a vampy with just a touch of sparkle. The formula on these is great as usual. Color Club formula is usually very consistent and smooth and this is no exception. 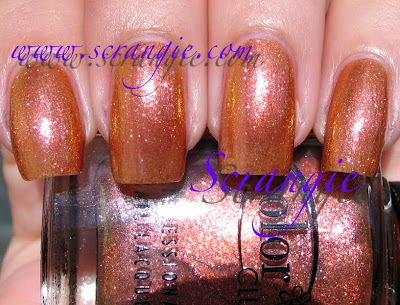 The holos are so dense you could get away with one coat, but I did two of everything for these pictures. Actually, I did three coats of Wild and Willing. Anyway, thin, smooth but not watery. Very easy to apply. Drying time is average except for the holos which dry very quickly. The wear on these is fantastic- I wore Wild at Heart for almost a week and it looked like I had just applied it. The set comes with a 0-60 Speedy Top Coat, which is supposed to be a quick dry topcoat, but... It isn't... I didn't have any luck with it, but I figured I'd mention it. It stays sticky and dentable for a long time. Oh, Color Club. You are so wonderful. You always give us something cool. And what's cooler than holo? Not much, that's what! The only thing I don't love about the Wild At Heart collection is the frost finish on On The Wild Side. Other than that, awesome. It rocks. I have some more cool seasonal Color Clubs to post soon (and there is glitter involved). Woohoo! Weee! I love Color Club. I've been *needing* this collection (minus the frosty steel color, aside from the brush strokes showing it's not a color I'd wear anyway) since Siobhan posted pictures. Every day I've been at that damn head2toebeauty site and *nothing*! When are they going to post them for sale, damnit?! :D Thanks for the swatches and notes on the formulas, as always! Scrangie, does the Black remind you at all of $OPI Never Enough Shoes? This collection looks great! I really need to to try this brand! That's such a great collection. There isn't one I don't like...although the first one is a but brush-stroky. I have the whole collection for men from BB Couture. So there's one I don't need. The rest I do. They all look gorgeous on you. I'm wearing YOU on my fingers for 5 days now. Just a bit of tip wear. I love this color Scrangie. I think I'm going to have to have Love 'Em, Leave 'Em, Wild and Willing, and With Abandon. Thanks for the swatches! This is the second time I've seen Wild At Heart swatched (first being on The Hungry Asian), and this has cemented my resolve to get this one. Jewel-tone purple plus holo? I'm in love! I'm so not a fan of glitters/shimmers but I NEED these! Thank you again Scrangie! Great posts you have here. Does Rule breaker remind any of the Nubar Green collection polishes? This is unrelated to this post, but have you checked out the new MAC collection of nail polishes? I'm positive almost all of them can be duped. On the bright side, there's a green that I'm sure you'd love. I need that purple holo - it's too gorgeous and I've been holding out for the perfect one. I think this is it! Your pics of Wild and Willing make it appear really gorgeous. Wild at Heart has stolen my heart. I will be budgeting to grab these. I absolutely love Color Club and they're so underrated! I am shockingly in love with this collection!!! I need more holos, seriously they are beyond cool on nails. Wild at heart for me is definitely the stunner here, LOVES THIS!!! I am going to have to get these and put them on my blog! Great colors! I love the idea of a purple holo. Now that you've mentioned Motley Crue, I have the urge to listen them. Beautiful swatches! Sadly, Color Club isn't available in Singapore, but then there are always *cough* alternative sources *cough*. Right with you on the frosty steel but the others are just lovely, was loving the green til I scrolled down and saw the purple holo, quickly replaced as fave by the black glitter!! Again no idea if I can get these in the UK but am going to have to try! I definitely need Wild at Heart. I can't stop starting at pics of Love em & Leave em - I am very cool toned, but might just have to order this one too!!! Thanx for the beautiful pics! I love the holo ones! The purple holo is stunning!!! I need all of these - they're utterly gorgeous! Thanks for awesome swatches as always. That purple holo is to die for. I HAD to have this collection after I saw it here. So the bank account suffered a minor blow, as I also decided to get a few colors from the browns collection and the femme fatal collection...the yacht collection...! Do you think With Abandon is like $OPI's "Never Enough Shoes"? I love With Abandon, Rule Breaker and Wild and Willing. With Abandon reminds me of the paletas (lolli pops) from Mexico that have the chile on them. It looks like it has chile on it. =) Okay I don't know if anyone knows what I'm talking about. Im so sad Scrangie, I just LOVE the color of Wild and Willing and it came today....and it looked terrible. I dont know if it was my application, or what. I did find the formula a little odd- but when my mani was done...it looked thick and weird. I WANT to wear this color because I love it. Heh, I'm three years late, but I wanted to drop a line. I just got Wild At Heart in the mail on Friday, and I am ridiculously pleased with it, so of course I went to see if the internet agreed with my assessment :) Google brought your entry up as one of the first. And you're right- what I see on my fingers is a bit warmer toned than what's in the picture, but HOT DAMN is it pretty!